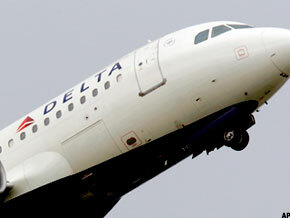 Delta recently laid out its vision for a profitable 2012, and other airlines expect the same. Even AMR's bankrutpcy is seen as good. ATLANTA ( TheStreet) -- Airlines are likely to be profitable next year, reflecting an industry restructuring with more fees and less capacity. It is even possible a miracle will occur and investors will realize airline stocks are not such bad investments. The industry's anticipated success, despite high oil prices, would provide the backdrop for the drama of the AMR ( AMR - Get Report) bankruptcy, which is expected to play out throughout 2012 and probably into 2013. In fact, a positive industry climate ought to benefit American as it restructures, because the success of American's legacy peers provides a clear path to success. American already follows the new industry model of reduced capacity and fees for services. Shedding costs in Chapter 11 is the step it has not yet taken. In any case, American's restructuring-induced reduced capacity is expected to benefit the entire industry. "The AMR bankruptcy, in our view, represents another step in the industry's restructuring," wrote Deutsche Bank analyst Mike Linenberg in a recent report. "The outcome is likely to be a more formidable U.S. airline industry." While airlines have not historically been profitable when GDP is growing at less than 2.5% a quarter, things are different now, Linenberg says. He forecasts industry profits of $2.9 billion next year, up from $2 billion this year, a result of "a decade of restructuring and an industry run by management who are much more focused on maximizing margins rather than market share." Delta ( DAL - Get Report), the world's second-biggest carrier, laid out its view in a recent investor day presentation. The carrier said it expects to earn $800 million this year and to be solidly profitable in 2012. The carrier anticipates it will easily gain $100 million in revenue lost to the earthquake and tsunami in Japan in March, and $200 million in the New York area, where it plans to grow at LaGuardia Airport after acquiring slots in a trade with US Airways ( LCC, which got slots at Washington Reagan National in return. In Europe, Delta plans to reduce capacity by 7%. Avondale Partners analyst Bob McAdoo says Europe's problems will not necessarily become problems for the airline industry. "If the euro falls apart, then the dollar strengthens," McAdoo said. "That just makes fuel cheaper." US Airways has sketched out only minimal changes for 2012. These include shrinking at LaGuardia, where it loses close to $75 million annually, growing at National and completion of its continuing effort to modernize the fleet that serves the Phoenix hub. Of course, it is widely believed that US Airways will move to merge with American, which would lead to somewhat more substantial changes.